Workshop at the World Money Fair in Berlin sheds light on the world of third-party grading. While the regular coin show hustle created a constant level of noise down in the exhibition hall, a handful of coin collectors and dealers gathered in the gallery of the show's main hall, meticulously tilting coins to all sides, examining various details with a magnifying glass and gaining an overall impression from a distance. They whispered with their neighbors, pondered and noted a number on a sheet of paper. After half an hour, everybody had seen a total of 20 coins, vintage and modern pieces from around the world. And when the answers for this short coin quiz were revealed, one could hear a lot of whispering. Some coin grading experts say that "third party grading," which is the professional certification of collector coins by impartial companies such as Numismatic Guaranty Corporation (NGC), is an art. Other graders point out that coin grading is a language that needs to be learned. 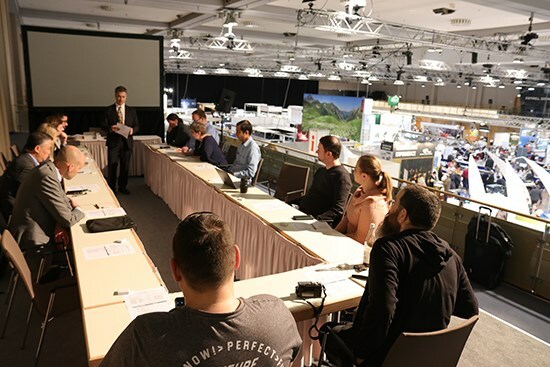 That is why, for the first time ever in Germany, interested dealers and collectors had the rare opportunity to attend a custom-made seminar on coin grading during the "World Money Fair," one of the biggest coin shows in the world, which took place in Berlin from February 1st to 3rd, 2019. David Camire, a Grading Finalizer with NGC, leads a grading seminar at the World Money Fair in Berlin in February 2019. In cooperation with the organizers of the World Money Fair, NGC put together a grading workshop that was held at three separate times. A grading expert had prepared an introduction to both the art and the language of grading for his audience. David Camire has been a coin collector for over 40 years and is a specialist in minting techniques. He also worked as a dealer before joining NGC and has been working as a Grading Finalizer for over 20 years – a leader of the grading team who reviews the assessment of the other graders and sets the final grade. "To describe coins, you have to be able to compare them," explained Mr. Camire at the beginning of the workshop. The genuineness could be clearly defined as a "yes" or a "no," but according to Mr. Camire, a scale had become necessary in American numismatics in the 1950s for the accurate description of the state of preservation, and it is known as the "Sheldon scale." That system translates the general grading categories such as "VG," "XF" or "Brilliant Uncirculated" into a detailed scale. The scale begins at 1 (for the most worn coins) to a high of 70 (for the most pristine). The grade of 70 is assigned, according to Mr. Camire, to a coin, "just as it came out of the mint and without any traces of wear." According to Mr. Camire, different grades predominate depending on whether you are dealing with vintage coins and modern coins. While vintage coins usually reach a grade up to MS 65, modern coins usually achieve a grade between MS 67 and MS 70. Coins that have some form of wear from circulation would be classified underneath the "MS" (Mint State) spectrum, and could reach a maximum of "AU 58" (a coin with this grade shows minimal signs of wear at the highest points of the relief). Uncirculated coins have a range between MS 60 and MS 70, but only if they have no traces of wear. As part of the grading workshop, Mr. Camire gave some rare insights into the work of a grader. He explained that the graders usually start at the top end of the grading scale (70) then deduct for the problems on the coin (thus points) to achieve a final grade. A coin at the lower end of the MS spectrum (i.e., an MS 60 coin) may show more imperfections – for example, from being transported in bags from the mint to the bank – but it may not be worn from circulation. Mr. Camire pointed out that the difference between the 69 and 70 grades is quite minimal, especially with modern coins. In addition to numerical grading, Mr. Camire also addressed those cases where it is not possible to assign a numerical grade. If the coin has some severe form of mishandling, alteration or environmental damage, it receives a Details Grade. The coin is adjectively graded in regards to the amount of wear (i.e., AU Details) followed by a description of the problem (i.e., Scratched). Apart from the necessary basic knowledge, the experienced grader also had some advice for the next submission to a grading service. For grading, Mr. Camire recommends a darkened room with the only light source being a 75- or 100-watt light bulb. The only supporting tool should be a loupe (a type of magnifying glass). He suggested that the coin should first be viewed under the light from the distance of an arm's length to gain a general impression and to check its authenticity. A loupe is not necessary at this stage of the grading process. The coin should be tilted in all directions to detect even those imperfections that go undetected by a particular light direction. Contestants had the opportunity to test their grading skills with 20 coins. After the roughly 30-minute grading crash course, the participants were allowed to test their skills and review a selection of 20 world coins. 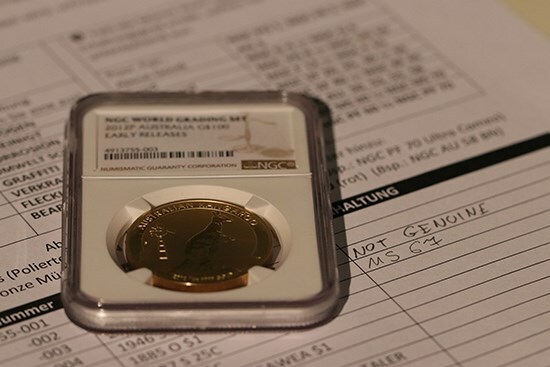 And NGC did not assign an easy task to the workshop participants: In addition to different historical eras and countries from around the world, some coins requiring Details Grades were also included. And even a fake was included in the selection. The coins were then scrutinized – and surprising observations were to be made: For example, several milk stains on a modern Panda silver coin were only visible when the coin was tilted in a certain direction. And the counterfeit version of a $100 gold coin from Australia with the famous "Australian Kangaroo" design posed an unexpected challenge for some of the workshop participants, including professional coin dealers: There were heated discussions on whether to grade the coin from the Far East as an MS 68 or an MS 69. This Australian coin was part of the grading quiz. The correct answer for it is: Not Genuine. Once again, the importance of authentication and impartial grading by a professional and specialized grading service such as NGC became apparent. 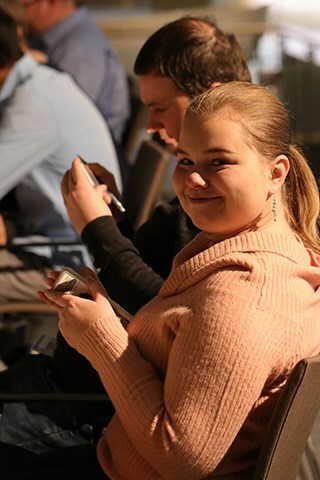 One of the attendees of the NGC grading seminar at the World Money Fair in Berlin in February 2019. 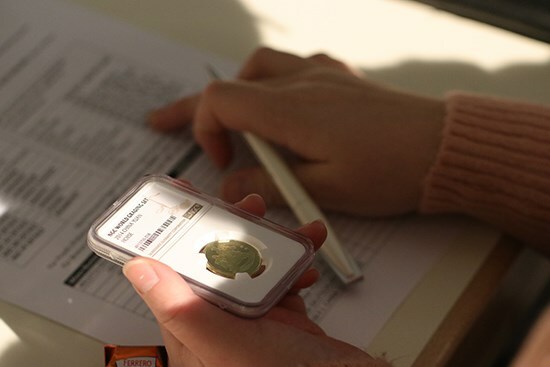 The positive feedback after the workshop – and some astonished reactions after the announcement of the actual grading results of the sample coins – made it clear how important and valuable precise background information is when it comes to "third-party grading." NGC will, therefore, continue its efforts to provide collectors, investors and traders with the necessary resources to develop a deeper understanding of the grading process and to discover the benefits of this form of coin certification. Sebastian Wieschowski has worked as an author with a focus on numismatics and precious metals since 2007. His articles have been published in magazines such as MuenzenRevue, MoneyTrend, Coin World and the Journal of East Asian Numismatics. He is the author of the Bullion Book and the Fake Coin Bible and a graduate of the School of Economic and Political Journalism in Cologne, Germany. This is a guest article. The thoughts and opinions in the piece are those of their author and are not necessarily the thoughts of the Certified Collectibles Group.